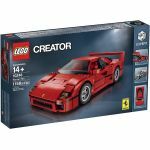 This category contains licensed LEGO® construction sets from Ferrari™. Now, you can recreate your own versions of their most famous cars. Get up close and personal to one of the world’s greatest supercars!